I've been stepping up my skincare routine lately and I'm loving the results. I'm always trying new products but these are what's working really well for me right now - my skin is looking great (if I do say so myself!) and I feel like I've finally found a routine I'm really happy with (and one I'll stick to!). This being the case, I thought I'd run through the products I'm using right now. So I stumbled across this one on offer in Boots when I ran out of my usual remover (Garnier Oil-Infused Micellar Cleansing Water, for anyone interested). I think this is a relatively new product and I was intrigued by the "professional" description as well as the claim to have 0% product residue and the ability to remove waterproof products. I'm really enjoying using this so far - it definitely gets my makeup off with ease, particularly my eye makeup, and I do find I'm using a lot less cotton pads than I was with my previous makeup remover. I think this will be my go-to from now on, as I'm really impressed with it! Once I've taken my makeup off I'll wash my face with Dermalogica's Special Cleansing Gel*. 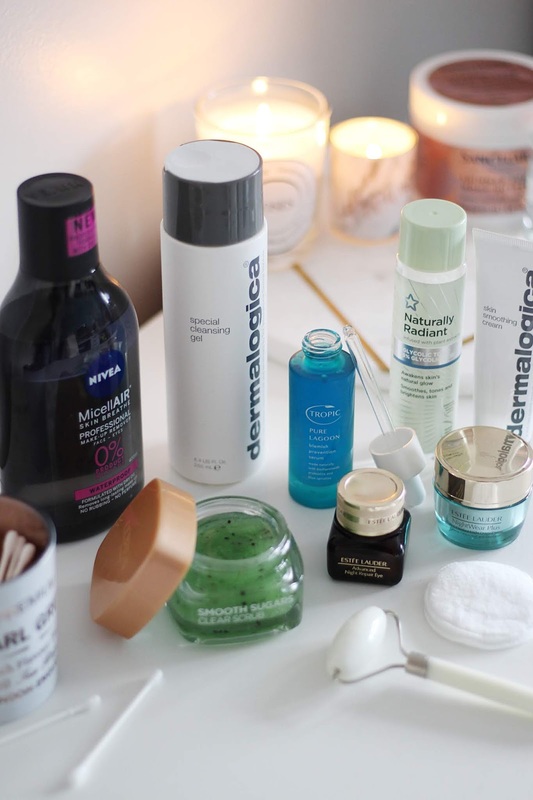 I've been a fan of Dermalogica products for years now and this is definitely up there with my faves - it leaves my skin feeling super soft and squeaky clean, and a little bit goes a long way. It's obviously not the cheapest but for the results I think it's worth the price tag! Okay so I'm a little bit in love with the Naturally Radiant Glycolic collection from Superdrug at the moment and this is definitely one of my favourite products. I love glycolic acid anyway, so when I found this range (at an amazing price) I went a bit wild and bought everything. I use this toner after I've cleansed and it makes such a difference - my skin feels so much smoother after using this! This one is a very recent addition to my skincare collection, but so far I'm really enjoying using it. I switch up my serums quite often depending on my skin concerns and this is amazing for when I'm blemish-prone. I've noticed quite a few blackheads lately as well as the odd spot (which I don't usually get anymore, praise Roaccutane) and this has worked wonders at clearing them up. It is weightless on the skin and full of skin-loving prebiotics, so I feel like I'm really looking after my skin when I use it. Another favourite from Dermalogica, I absolutely swear by this as my daily moisturiser. The most exciting thing is they've recently updated their best-selling formula and it now has 48-hour hydration! I've been lucky enough to receive a tube of the updated version to try and I'll be doing an in-depth review on that soon, so keep an eye out. The older I get the more I realise I really need to keep my skin in tip-top condition, so a few months ago I started investing in some bits from Estee Lauder. I picked up the Protect & Hydrate gift set for around £22 (I've only been able to find this in store in Debenhams, so I'd say if you see it, get it!) which comes with some mini versions of their best-selling skincare products, all of which I've been loving. I also picked up the Advanced Night Repair Eye because I've heard so much about it and while I haven't noticed amazing results, I'm enjoying using it. I probably wouldn't repurchase though as it comes with a hefty price tag, but I think perhaps in a few years time it might sneak back into my routine. Another fairly recent addition, I'd heard so much buzz around jade facial rollers that I thought it was best I try one out for myself! I use this after I've cleansed my skin and applied all my serums/moisturisers etc, and it's supposed to help ease tension, eliminate toxins and de-puff the skin. The thing that appeals to me most about this product is that it's said to help you reap more of the benefits of your skincare products, as it helps fully absorb them into the skin. I'm really loving using this - I definitely think it helps my skin absorb the products more and it definitely helps ease tension! The rolling process in itself is really relaxing, and I feel as though I'm really treating my skin when using it. I picked this scrub up a little while ago as it was on offer (I know, I'm a sucker for discounted products) and I'm so glad I did. I always tend to neglect exfoliating for some reason, but this product makes me really look forward to it. It smells so refreshing and leaves my skin feeling super smooth and blemish-free - it works wonders for blackheads. The only downside is you don't get much in a tub, but I will most definitely be repurchasing when this runs out! So that's my current skincare routine! Are you using any of these products at the moment too? I'd love to hear what skincare products you're loving right now!